Imphal, January 31 2010: While the rest of the world is sleeping after the day's work, some people have to wake up in the dead of night precisely at 1 am and go on a long journey to fetch water for the day's use. This is the harsh reality villagers of Kuirei and Kanhang, located between Ukhrul-Jessami road of NH 150 are undergoing in this so-called cyber age. The only water source for these two villages is a water-hole located in the hills between the two villages. During dry season, the villagers face acute shortage of water. Again, the villagers have to struggle hard during rainy season too. Water is available during the wet season but they have to exert maximum physical strength to climb down a steep and slippy track and ascend the same track carrying water. As the villagers have to trudge with great care, it takes almost one hour for a villager to fetch water from the water-hole though it is just one kilometre away from the village. Under such harsh condition, fetching water for a day's use has become a daily battle for the villagers. The two villages have around 100 families each and total population of 700 people each. For them waking up at 1 am has become a daily routine over the years which they cannot avoid otherwise they have to do without water for the whole day. If any villager wakes up a little later, he/she may not get any water. "In such cases, we borrow water from the neighbours who managed to fetch a little extra water", said Alex Zingkhai of Kuirei village. Compelled by these conditions, the villagers use water most judiciously. At times, one cannot even drink to the heart's content. The villagers can make up other shortages, but they have no means at all to make up water shortage. They villagers have no capacity to lay pipes to bring water from Siroy which is 15 kms away. Nevertheless, the villagers were confident they can accomplish this mission provided there is some assistance from the Government. 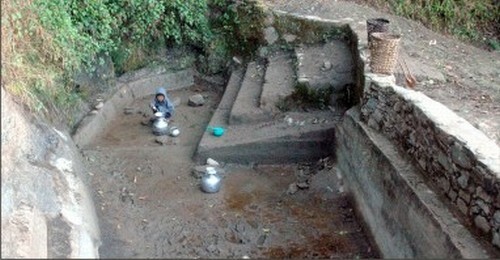 The water-hole being used by Kuirei an Kanhang villagers is so shallow that glasses are used to draw water, said Alex. The Government dug a hand-pump in 1977 but it has gone out of order since many years back. Faced with perpetual water shortage, the villagers are very much conscious about the importance forest. As the forest cover in the area has diminished a little, the villagers have been planting tree saplings, Alex said while adding that his words could not explain the plight of water shortage fully.